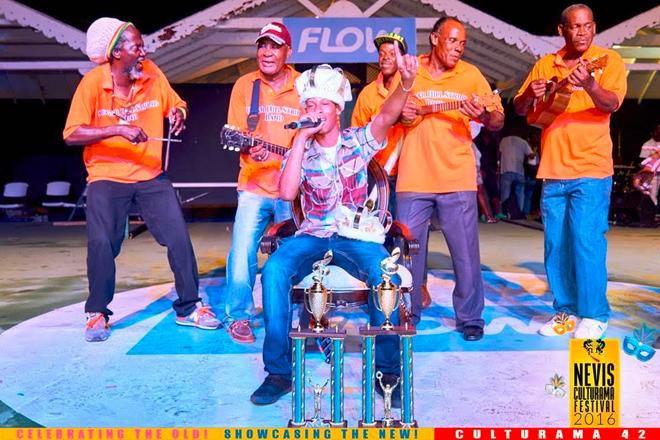 (ZIZ News) — For the first time in the history of the Nevis Soca Monarch Competition, one person has won both the Groovy and Power titles. On Thursday night during the Nevis Soca Monarch Finals Delroy “Delly Ranks” Huggins, dethroned both the reigning Groovy Monarch, Speedy, and Power Monarch, X-man at the Nevis Cultural Complex..
“Whoops” as the winning Groovy piece is called, featured a more traditional accompaniment in the form of string band music which was done by a popular string band in Nevis. “Sweet” the Power piece had enough sweetness to beat its rivals and is one of the featured tracks on the Kore summer album launched in early July. Delly Ranks was followed by 1st runner-up Speedy and 2nd runner-up Hollywood in the Groovy category. X-man placed 1st runner-up and Daddy Tusty 2nd runner-up in the Power competition. The activities for the Culturama 42 celebrations continue on Friday night with the Senior Calypso Monarch.